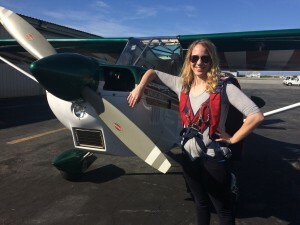 Aircraft dispatcher Caitlin Lyons, also known as Cessna Chick on her blog, does not allow adversity to get in the way of her goals. Living in Manhattan without a car during her private pilot training offered quite the challenge. Her commute the closest general aviation airport resulted in over one and half hours on a train followed by a three mile walk while still maintaining a full-time job! During the 2016 EAA AirVenture Caitlin caught a break, she had earned the ‘Get into the AIR’ scholarship awarded by Aviation Insurance Resources (AIR). Caitlin thanked AIR for getting her back on track towards her goal of becoming a flight instructor. “It helped me finally do my BFR which was my first since earning my certificate and was delayed more than I would’ve liked it to be! Since then I was able to fly a bunch in the early winter working on my instrument rating and getting time under my (pink!) foggles – always on beautiful days I would’ve loved to enjoy the views of the Pacific. I’ve already knocked out my Instrument and CFII written tests and working on my Commercial/CFI/FOI written tests as well so I can focus on the flying portions. It puts a time limit on my training and gives me even more motivation. I’m hoping to finish up my instrument rating by the end of the summer!” she explained. Due to the success of their inaugural scholarship, AIR is once again offering the $500 ‘Get into the AIR’ scholarship. The scholarship can be used towards any phase of flight training, a flight review, written exam, instrument proficiency check or a check ride. AIR is seeking an applicant whose essay and recommendation letter best describes their goals, drive and involvement in the aviation industry. The scholarship winner will be announced at the 2017 EAA AirVenture in Oshkosh, WI. The deadline to enter is June 15th. Scholarship applications are available for download at http://www.AIR-PROS.com/scholarship.